Will Apple Ever Top This List? If only we could change the rules. There are plenty of lists that Apple (Nasdaq: AAPL) tops. The Mac maker has risen to become the largest company in the world by market cap, currently sitting around $535 billion after surpassing oil giant ExxonMobil (NYSE: XOM) earlier this year. The company overtook longtime rival Microsoft back in 2010 and hasn't looked back since. 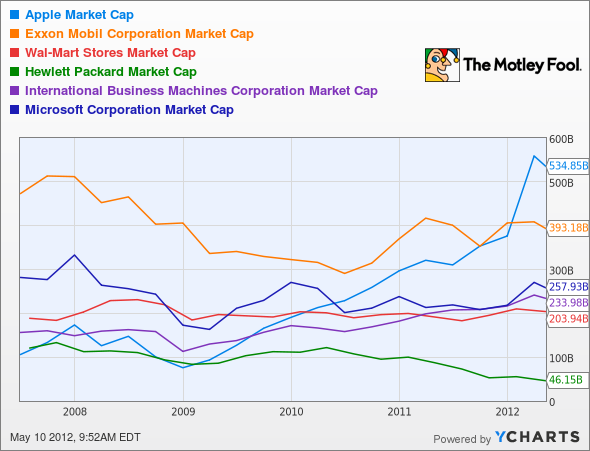 Top-dog PC maker Hewlett-Packard (NYSE: HPQ) has a market cap less than a tenth of Apple's. However, there's one list whose No. 1 spot remains elusive for Apple: the Fortune 500. This annual ranking of companies by revenue has seen retail titan Wal-Mart (NYSE: WMT) and ExxonMobil tag team the gold medal for years on end, passing the crown back and forth. Well, this year was Exxon's turn after Wal-Mart's top line enjoyed two years at the top. Exxon's revenue rose 28% to $452.9 billion, enough to dethrone the retailer's $447 billion. Hewlett-Packard still leads Apple in this race, sitting in spot No. 10 with $127.2 billion, relatively unchanged in its ranking over the years, even though its CEO spot was anything but unchanged. Meg Whitman has been sitting in the driver's seat for just over six months, after Leo Apotheker's one-year stint. Apple has leapt 18 spots to rank 17th on the list with its $108.2 billion in sales last year, up from No. 35 on the 2011 list. Microsoft landed in No. 37 this year, while IBM (NYSE: IBM) held down the fort at No. 19, slipping by just one spot. Of course, of all of these companies, Apple continues to put up the most growth by far, allowing it to quickly climb the ranking. 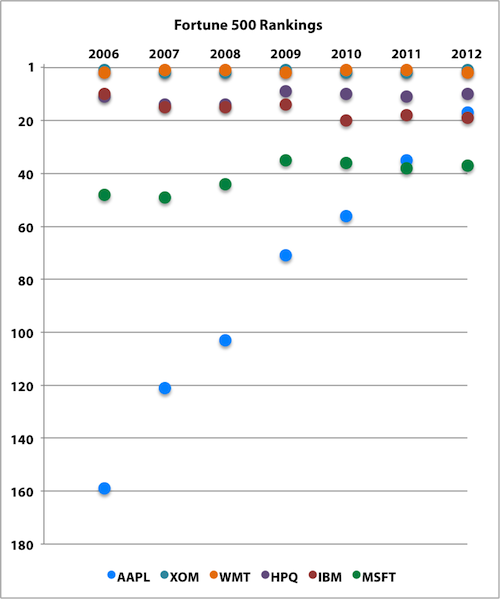 Here's how quickly Cupertino has ascended the Fortune 500 over the past seven years. While most of the other notable stalwarts have fluctuated within a relatively narrow range, Apple has quickly jumped from No. 159 in 2006 to No. 17 in 2012. Although this chart shows how quickly Apple is moving higher in the Fortune 500, keep in mind that the difference in revenue between No. 17 and No. 1 is almost $345 billion. After Exxon and Wal-Mart, the No. 3 spot was Chevron with $245.6 billion -- a gap of $201 billion just between No. 2 and No. 3. Even if we quadrupled Apple's revenue to $433 billion, it would still only displace Chevron as No. 3. Can we change the rules? On the other hand, if we were to rearrange the Fortune 500 based on profit instead of revenue, Apple would jump to No. 3 with $25.9 billion in net income last year. Exxon would still be top dog with $41.1 billion in earnings, and Chevron would be No. 2. If we were to jump forward to today and look at trailing-12-month net income, Apple would be nipping at Exxon's heels. Exxon's TTM bottom line is $39.9 billion, compared with Apple at $38.6 billion in profits over the past four quarters. At the rate the Mac maker is growing, Apple should claim the top spot in profitability by the time the 2013 Fortune 500 rankings roll around. As it stands, it's hard to imagine that Apple will ever claim the No. 1 spot in the Fortune 500. If it did, we'd be talking about it a multitrillion-dollar company at that point, which is beyond unheard of. If Apple's revenue began to approach $500 billion, its profit would be in the ballpark of at least $125 billion if we conservatively use a net margin of 25%, even though its net margin is currently higher than that and has been steadily rising over the years. Having Apple top the Fortune 500 is a tall order to fill, but tall orders are becoming somewhat of a specialty for Cupertino these days. The Mac maker is set to begin paying a dividend in a matter of months, and with its profitability and cash flow, those payments look like they'll be rock-solid. There are plenty of other rock-solid dividend stocks that can help you secure your future, including these nine. Two of these companies are even mentioned in this article. Grab a free copy while you still can.